A year’s-worth of bragging rights are up for grabs during the upcoming 29th Annual Oklahoma Cattlemen’s Association Range Round-Up. The two-night event gets underway Friday, August 23rd, at the State Fairgrounds Arena. 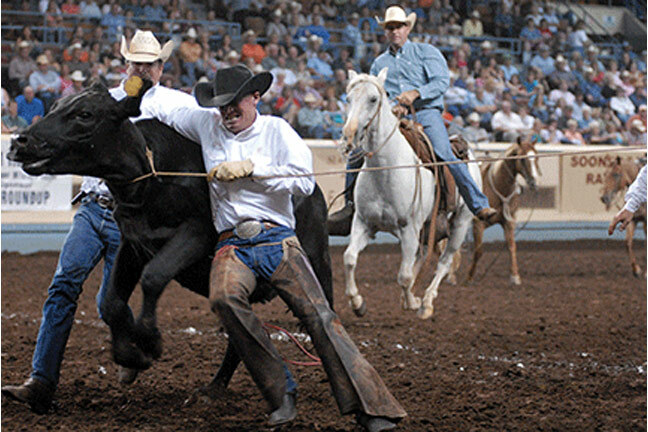 Twelve teams from historic Oklahoma ranches will square off in head-to-head competition. The contestants compete for the coveted “Top Hand,” “Top Horse,” and “Tough Hand’ awards. “These are all Oklahoma Cattlemen’s members,” Kelsey said. “Spectators who come will each receive some information about each of these ranches and you’ll see some of the tremendous heritage and tradition in these family operations-fifth-, sixth-generation operations in some cases-which is just fantastic and very typical of the cattle industry in Oklahoma which is very family oriented. A lot of these folks who are going to be competing are, of course, owners and operators in the ranches as well as just some good, hard-working ranch hands. Kelsey said range roundup competitions are gaining in popularity and there is an actual circuit that some of these ranches compete on. The winner of the Oklahoma Cattlemen’s Range Round-Up qualifies for the event in Amarillo, Texas. Not only is OCA’s Range Round-Up a showcase for the talents of ranch owners and ranch hands, Kelsey said, it is an opportunity to give back to the community. The proceeds from the event are donated to the Children’s Miracle Network. OCA has contributed more than $420,000 to the Children’s Miracle Network in the last 15 years. Click on the LISTEN BAR below to listen to the full conversation between Michael Kelsey and Ron Hays. Ron Hays talks with Michael Kelsey about the upcoming OCA Range Round-Up.